Eyes allow you to appreciate sunsets. Eyes are how people communicate without speaking. Eyes are the windows to your soul. But eventually the paint will begin to peel and be in need of a touch-up. If you aren't using an eye cream that addresses all of the signs of aging skin around the eyes in a gentle formula, you could be adding to the damage. Treating your eyes like the other skin on your face can irritate the skin and result in tired, droopy eyes that are more susceptible to the signs of aging and fatigue. The skin around your eyes is about the thickness of an eggshell. Think about it: with skin so thin and delicate, do you really want to use harsh lotions or abrasive products? You shouldn't need to use a heavy hand or harsh products on such a delicate area of your face. Treat your eyes right with a gentle, beneficial way to see real results. 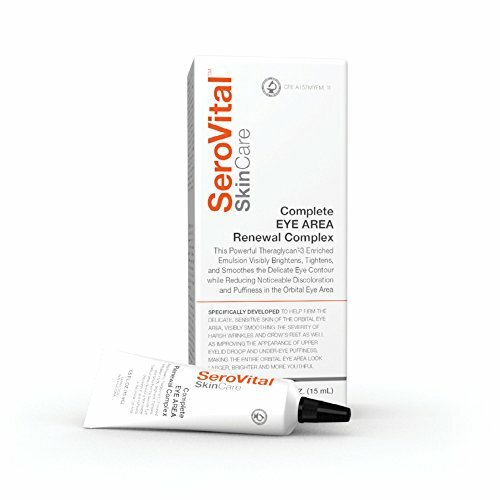 SeroVital SkinCare's Complete Eye Area Renewal Complex is specifically developed to beneficially impact the visible signs of aging eyes, including improving the appearance of crow's feet, fine lines, puffiness, eyelid droop, and even dullness, as well as noticeably brightening and tightening without damaging the delicate skin around your eyes. SeroVital SkinCare is a division of SanMedica InternationalTM, the company that brought you SeroVital®, the "anti-aging" breakthrough everyone's talking about!